Richard Clifford Diebenkorn Jr. was born in April 1922 in Portland, OR, and at age two, the family relocated to San Francisco. In 1940, Diebenkorn entered Stanford University. He concentrated in studio art and art history, where he was exposed to such American artists as Arthur Dove, Charles Sheeler and Edward Hopper. In June 1943 Diebenkorn married fellow Stanford student Phyllis Gilman and then served in the U.S. Marine Corps from 1943 until 1945. While stationed in Quantico, VA, he visited a number of museums, including the Museum of Modern Art, NY, and the Phillips Collection in Washington, D.C., where he was drawn to the powerful influences of Cézanne, Paul Klee, Mark Rothko and Matisse. 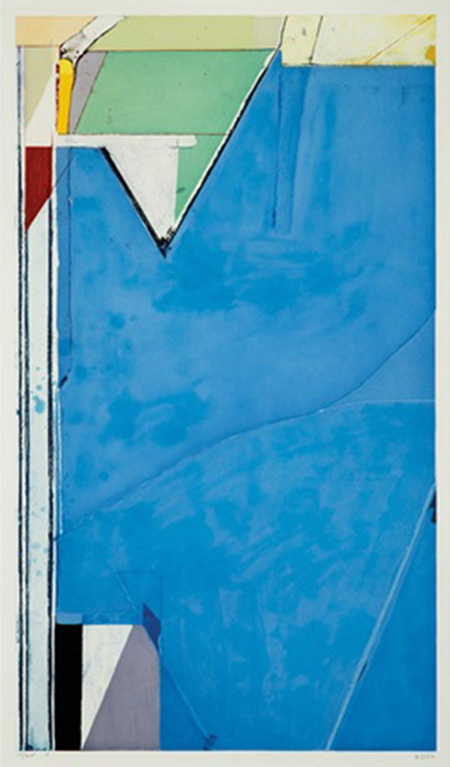 Once on the path of being an artist, Diebenkorn spoke of “rightness” in painting; referring not only to the mechanics of composition, but to the state of the work’s “soul.” Incorporating an astonishing variety of techniques, he mastered the ability to create solid structure, by anchoring pictorial space without sacrificing a sense of atmospheric lightness. In 1966 Diebenkorn accepted a teaching position at UCLA. He and Phyllis lived in the beach communities of Santa Monica and Venice, neighborhoods of choice for some of the region’s best artists such as Sam Francis. He maintained his studio in the Ocean Park sector of Venice, where over many years he created about 135 paintings that were highly metaphoric spatial and chromatic explorations—each its own unique universe. Diebenkorn achieved greatness. His seductive palette, visual intelligence and complex figurative and abstract works earned him broad appeal. We are so blessed that his considerable body of works on paper enable more of us opportunities to live with these radiant light-filled fields of reverberating color. Our expertise is not limited to the selected artists presented on our website. Please feel free to contact us about your own art preferences. Private art brokerage and dealership serving clients for over 35 years. The artwork on this website is only representative of works that TABA Inc has the privilege of handling and not for sale unless specifically stated otherwise.